AELIUS II is a push-pull hybrid monoblock power amplifier using two gain stages with no overall feedback. The first gain stage uses a tube in single-ended class A operation, transformer coupled to the output stage. It is unusual practice to implement an inter-stage transformer in a solid state or even hybrid amplifier. With the transformer two tasks are achieved. Perfect phase splitting and low impedance drive. Thus no need to use an additional intermediate amplifying stage, so transparency and purity of the signal is preserved. We designed a special transformer for this purpose with a very wide bandwidth of 10-70 KHz. The bandwidth of the transformer defines also that of the amplifier. The output stage uses components of the same polarity (N-channel), working in the same topology. The power supply for each side is floating in respect to the ground using power supply chokes for smooth filtering. The output stage is self-stable, eliminating the need to use servo circuits for adjusting dc offset. Both outputs, plus and minus carry signal in opposite phase. Aelius is most certainly a revolutionary product. Sound purity, endless power, outstanding design, unmatched build quality. 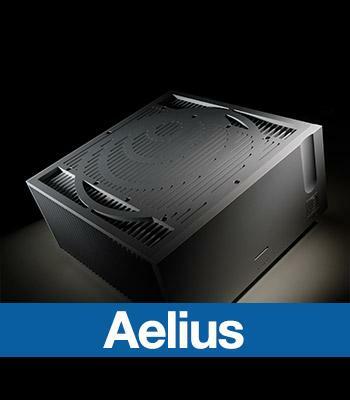 This is AELIUS II power amplifier.